Being involved in a traffic accident is an extremely common yet unfortunate part of many people’s lives. Whether the incident was your fault or not, once you are done worrying about your health, which is clearly the most important aspect, it is easy to become overwhelmed with all of the questions you may have right after the accident or even in the days and weeks that follow. Below are some of the most frequently asked questions about traffic accidents that may help guide you through what can be a stressful situation. 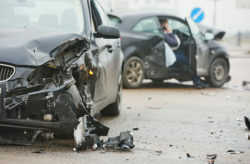 What actions should I take if I have been involved in a traffic accident? The first thing you should always do is to make sure you and everyone involved is healthy and safe and to seek medical attention to confirm this. Once you know that you are okay it is important to take notes about what happened as soon as you can. It may seem like you were just involved in something that you will never forget, but between the shock you may feel, the fear of being injured or the damage to your car, and even the adrenaline that rushes through your veins, there are many feelings and emotions that may make it hard for you to remember exactly what happened once you start to calm down. That is why as soon as you are able to you should take detailed notes of everything surrounding the situation. From who was with you in the car, to what your destination was, to the weather and road conditions outside, to the speed that you were going and anything else you can recall from that time make sure to write it down. Try to take pictures to document your injuries, any damage to the vehicles involved, the conditions of the accident scene, and any other relevant information. Obtain the contact information for any authorities who respond to the scene so you can obtain the accident report. Ask for the contact information for any witnesses because they may not remain on the scene until the authorities arrive, and the authorities may not document the witnesses’ contact information. Remember, it is always better to have too much information than not enough. What will determine who is at fault in a car, truck, motorcycle, bicycle, or pedestrian accident? Any driver or pedestrian or cyclist who was not acting in a reasonably careful matter when the incident occurred can be considered at fault. The actions or conduct of the driver has led to an injury or damage to someone or something else. Is it always the other driver’s fault if I am rear-ended in a collision? In this situation, the blame will usually be put on the driver who hit the car in front of them, as the law expects drivers to keep a safe distance behind the other vehicle even in the case of sudden stops or movements. A variation on this type of situation is when a car hits another car from behind who then, in turn, hits the car in front of them. If the middle vehicle could not have avoided the collision, the person who started the chain of events will usually be the one considered at fault. If a car is making a left turn into oncoming traffic will they always be considered to be at fault for the accident? Usually, a car making a left turn into oncoming traffic will be considered liable for an accident to a car who was going straight in the other direction. This may not be the case if the other vehicle traveling straight was, for example, driving too fast or if they ran a red light, but in general, the car making the left turn will be considered at fault. What happens if the other driver shares some of the blame for the accident as well? Depending on the state you live in, the amount of blame each driver can take for an accident can drastically change the amount of compensation they may receive for the event. Some states allocate the damages according to the percentage that each party was at fault while some states do not allow a person to collect any monetary amount if they are proven to be at fault for any percentage of the accident that occurred. For example, in New Jersey, generally, a driver found to be a certain percentage at fault for an accident will have their recovery reduced by that percentage. However, if the driver is found to be more than 50% at fault for the accident, the driver will be barred from recovery. It is because of these intricate details that it is always best to contact a knowledgeable attorney who will be more familiar with the laws in your state. Being in a traffic accident can be an unfortunate situation; being in one and not having a qualified attorney like the ones at Bramnick Law will only make your battle in court more difficult. Contact Bramnick Law today at 877-423-4878 today to schedule your initial case evaluation.